1. Explain the importance of reward, praise, patience, consistency and timing in the training of a canine. 2. Identify all safety aspects to be followed during handler safety. 3. Demonstrate the proper use of all equipment to be utilized. 4. Explain the necessary maintenance of the canine and kennel. 3. Explain the necessary maintenance of the canine and kennel. 1. Demonstrate the proper use of equipment to be utilized. command, praise and reprimand delivery will be emphasized. 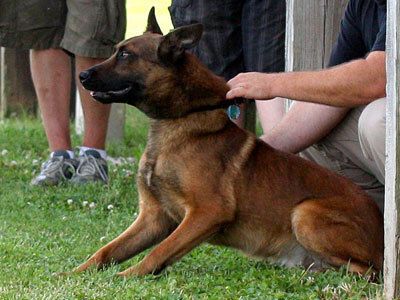 skills utilizing the "heel, no, sit, stay, come, and down" commands, both on and off lead. and introduce the variety of obstacles to which the canine and handler are exposed. 1. List the obedience commands to be taught to the canine both on and off the lead. 2. Explain the rationale for teaching all canine and handlers uniform commands. and at various distances from the canine while on lead. and at various distances from the canine while off lead. 6. Demonstrate hand signals and explain the use of different voice tones when giving commands. 7. Assist the canine to safely negotiate all obstacles and under varying footing conditions. 8. Demonstrate tolerance to other canines throughout obedience lessons. 9. Demonstrate ability to perform drill formations. 10. Demonstrate a familiarization of gunfire reaction exposure. various distances from the canine while on lead. various distances from the canine while off lead. 6. Explain hand signals and explain the use of different voice tones when giving commands. 5. Demonstrate hand signals and explain the use of different voice tones when giving commands. 6. Assist the canine to safely negotiate all obstacles and under varying footing conditions. 7. Demonstrate tolerance to other canines throughout obedience lessons. 8. Demonstrate ability to perform drill formations. 9. Demonstrate a familiarization of gunfire reaction exposure. The following exercises must be performed both on and off lead. The canine walks next to the handler for two (2) right turns, two (2) left turns and two (2) about turns. handler must down, sit and recall canine. than three (3) feet, utilizing one of the following: solid wall, chain link, picket fence, or window jump. clearance of sixteen (16) inches. The canine must climb and descend a six (6) foot minimum staircase. Unit Description: The principles of scent theory will be examined. searches, tracking, trailing, and building searches. 2. Recognize and identify the canine's sight, sound and scent alerts. 3. Explain the checking of wind direction. conducted by a drug detection canine, and the team approach to canine drug detection. 1. Demonstrate the ability to organize and control a systematic and proper search effort. methamphetamine, cannabis or any derivative thereof. 3. Demonstrate the "alert" activities when drugs have been discovered. automobiles, trucks, buses, airplanes, boats, etc. 2. The vehicles may be placed in any order or position as long as the teams have access to them. 3. The narcotics will be placed so as not to be retrieved by the dog. 4. The narcotics will be placed either on the outside or inside the vehicle. 5. No two hides will be placed on the same vehicle. 6. There will be a ten (10) minute time limit with a two (2) minute warning on the vehicle search. 1. The indoor search will consist of three (3) rooms. Each room will be a minimum of 400 square feet. There will be a time limit of one and one half minutes (1.5) per 100 square feet. 2. The rooms must be furnished. 4. The narcotics will be placed so as not to be retrieved by the dogs. 5. The narcotics will be placed at any height below the standard eight (8) foot ceiling. the handler must call his finds. start when the team resumes the search. nutrition and the proper methods and techniques used to maintain and care for a canine. 1. Demonstrate the proper method of daily health care, muzzling and transport of the canine. 2. Identify basic health hazards to the canine. 3. Explain and demonstrate basic first aid and basic grooming needs of the canine. 4. Explain the proper maintenance and sanitation of the kennel facility. 1. Explain the proper method of daily health care, muzzling and transport of the canine. 2. Explain and demonstrate basic first aid and basic grooming needs of the canine. also explain the importance of properly completed case reports.